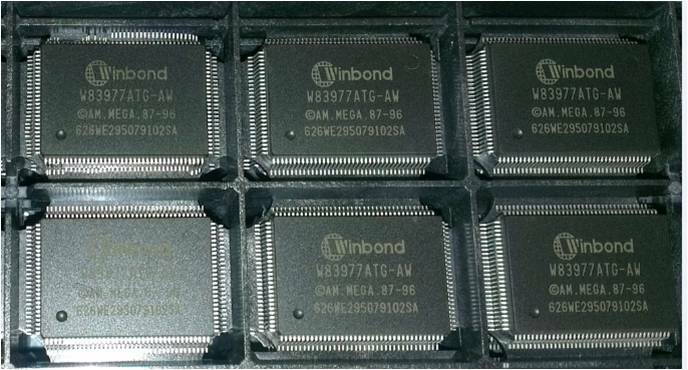 A customer sent Retronix's testing department a large number of these Winbond W83977ATG components and requested a visual inspection to determine their condition prior to use. The devices were bought as new and unused, but the evidence found by our testing team revealed that the parts were not compliant with standards set by IDEA-STD-1010B, Exhibit 46B Figure 12-79, Coplanarity Failures. The parts arrived in non-moisture bags, meaning that if they were going to be used, they would need to be baked beforehand to remove any moisture. Some of the components which were visually inspected by the testing team at Retronix also showed signs of contamination. Upon opening the first bag of components, Retronix's testing team noticed obvious damage to the top left component. Top tray of first bag opened - visible damage to top left device. Closer inspection of the devices uncovered contamination on the back of the component and damage to the pins. Left - contamination on back of device. Right - pin damage to device. Although some of the components displayed differing pin 1 indents, this may have been because the batches had mixed datecodes. This theory would need to be verified by Winbond. Due to the initial results of the visual inspection, as well as the more detailed results - which revealed pin damage and contamination - Retronix's testing team has ruled the components to be in "non-conforming condition." 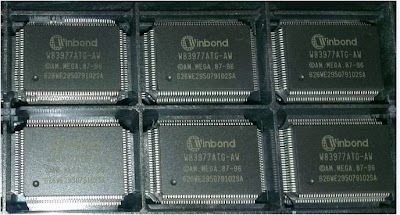 Retronix's testing department were sent CS5530AUCE Geode components with the request that they be visually inspected before use, much like the above Winbond case. These components were also sold as new and unused. But as soon as the testing department opened the box containing the components, they knew that these components were not what they said on the label. As you can see, although these components are on the same tray and have the same markings, they have different pin 1 indents and different top side edges. The visible differences in the shapes and pin indents of the devices. Upon closer inspection, Retronix's testing team discovered that the components had several scratch marks on their surfaces and signs of liquid contamination on the solder spheres. Left - scratches and evidence of re-balling. Right - liquid contamination on spheres. The CS5530AUCE Geode components also displayed evidence of being re-balled. The visual inspection revealed a number of anomalies and the more detailed results of the tests uncovered yet more unusual features in these components, such as scratches and sphere contamination. Accordingly, Retronix's testing team has ruled the components to be in "non-conforming condition." A customer sent Retronix's testing team a batch of Freescale MPC866PVR133A components and requested a visual inspection to determine their condition prior to use. The devices were bought as new and unused. When inspecting the packaging that the components had been delivered to Retronix's customer in, the testing team discovered that the label contained no manufacturer information or logo. Packaging label is missing manufacturer's logo and information. The components were then removed from the packaging and examined visually. This inspection uncovered a problem in the device's solder spheres - the spheres were scratched from underneath. 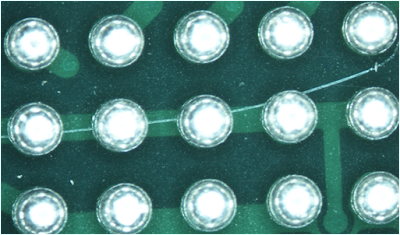 Visual inspection at Retronix uncovered scratches beneath solder spheres. The only way that scratches beneath solder spheres can occur is if the solder spheres have been removed, meaning that it is very likely that this component had been re-balled - despite the fact that it was sold to our customer as "new and unused." Further testing by Retronix also revealed that the device's solder spheres had evidence of contamination. Unfortunately, this was not the last of the component's flaws - the tests also showed that different sizes of solder sphere had been used to reball the device. Left - solder sphere contamination. Right - different sphere sizes used. Solder sphere contamination is a tell-tale sign of a suspect device - as is different sized solder spheres. Solder sphere contamination is a tell-tale sign of a suspect device - as is different sized solder spheres. This, coupled with the poor packaging which the components arrived in, has led Retronix's testing department to the conclusion that these components are "suspect counterfeit."